Have you ever supported a friend by joining them on some sort of crazy health challenge? I sure have and in this case, I knew before we started that it was going to be trouble. I just didn’t realize how much trouble it was going to be. I’ll tell you more about this experiment a bit later. I’ve always been one to experiment with my diet and health, so regardless of the expected outcome I knew I would learn something. In fact, much of the self experimentation I did back when I was hypothyroid helped me discover so much of what doesn’t work or will make you worse. But this experiment left me with the most severe brain fog I have ever experienced. It was so bad that I spent much of my work day hiding from people so that I didn’t have to talk to them. Eventually it got so bad to the point that I had to leave work, even though I was concerned that driving probably wasn’t in my best interest. …especially when it comes to brain fog, but also for many other thyroid related symptoms which you’ll see in a second. It’s a perfect example of a very common effect that hypothyroidism has on brain function and cognitive ability in general. When you suffer from brain fog and it limits your mental function, life becomes difficult on all levels. You can’t concentrate at work, affecting your ability to do your job. Even doing work around the house can become a challenge. It can make getting through your day very overwhelming. Well, that’s exactly what happened to my client Tim. It all boils down to energy production and heat. You see, your brain requires an enormous amount of fuel just to function. Your liver, muscles, and brain don’t store fuel (glycogen) well at all. You become deficient in thyroid hormone. You develop a damaged metabolism. And blood flow decreases to all of your cells, including your brain. When blood flow decreases, it becomes even more difficult to get thyroid hormone, fuel, and nutrients to your cells. …all result in very poor energy production from your brain. But here’s the important thing to understand. It’s not just the energy production that we need to live and survive. It’s also the heat produced as a result of that energy production. Remember, we are warm-blooded, meaning that we have to maintain our own high body temperature for us to stay alive and for our bodies, organs, and cells to function. With hypothyroidism, energy production becomes lowered and your body temperature drops. This is one of the primary causes of brain fog and other cognitive issues found with hypothyroidism. In other words, when your body temperature is below normal, mental function becomes limited. …and stress hormones, particularly cortisol, are a big one. Hypothyroid people compensate for their hypothyroidism by overproducing stress hormones, including cortisol. And when overproduced, cortisol itself can actually raise your body temperature while suppressing thyroid function at the same time. That’s not something you want to happen. The primary purpose of cortisol is to break down protein in your body to convert it into sugar as your blood sugar drops. The process of breaking down protein is thermogenic, meaning that it releases heat in the process. When lots of cortisol is present, it can artificially elevate your body temperature resulting in a temporary improvement in brain fog. This is why many people initially experience better mental clarity when switching to a low-carb diet because it increases cortisol production and therefore body temperature. However, low-carb diets are well known to suppress thyroid function as I discuss in an article called “Stop Eating Low-Carb (If You Care About Your Thyroid)”. This is why it’s extremely important to rule out the effects of stress hormones when properly testing your thyroid function. In other words, stress hormones can easily make your thyroid health appear normal when you’re quite hypothyroid. This is also why some people experience a worsening of brain fog when starting a proper thyroid diet. If suppressing the stress response lowers cortisol, then it can also result in an initial fall in body temperature. And this initial fall in body temperature is what can contribute to the temporary brain fog we sometimes see. But don’t worry because I’ll be showing you some simple and healthy ways to increase your body temperature and energy production in just a second. Low body temperature also affects many other hypothyroidism symptoms. Oftentimes you can experience direct changes or temporary relief in some of your thyroid symptoms by simply raising your body temperature. For example, a warm bath can quickly improve mental function and reduce muscle, joint, and arthritic pain. …the only way to get permanent relief is through permanently raising your body temperature. We do this by regulating your thyroid function and increasing energy production through the proper pathways. Yet, this is another area where modern medicine and doctors today are missing the big picture. Doctors continue to prescribe thyroid medication and oftentimes see changes in your thyroid labs values while your body temperature remains quite low and your symptoms unchanged, or even worsen. Doctors today fail to even take your body temperature into account at all. However, when you do account for body temperature, you can quickly and easily determine what’s working and what is not. This is why we teach our clients how to track their temperature and how to use it to optimize thyroid function. Then overcoming brain fog and restoring mental clarity becomes easy. It becomes a matter of decreasing things that limit brain function and increasing things that improve it. The overall best approach in eliminating brain fog and improving energy production is twofold. First, we want to eliminate the factors that lower body temperature and energy production. If you’re not producing or getting adequate T3 then energy production will be limited regardless. T3 is one of the fundamental drivers of cellular energy production and body heat. Of course, there are factors that inhibit your ability to use T3, as covered in this article on “How We Overcome Hypothyroidism When All Else Fails”. Oftentimes simple dietary changes can be very effective at improving your ability to use T3. In fact, in the 3 Food Triple-Thyroid-Boosting Daily Protocol, I show you a simple way to do just that. Saturated fats are not only thyroid protective, they also support healthy and efficient metabolism and energy production. You can find exactly what I recommend and how it supports your thyroid in this article on “3 Reasons You Need Coconut Oil for Thyroid Health”. One particular benefit of coconut oil is its unique ability to help energize your brain due to its high levels of keto-acids. Your brain can quickly and easily use these keto-acids as a significant source of energy giving your brain a much needed boost. This is why it’s being used effectively to help treat Alzheimer’s disease and dementia. There are many factors that influence metabolism and energy production aside from thyroid hormone alone. Red to infra-red light has been shown to effectively activate an important metabolic enzyme known as cytochrome c oxidase. Something as simple as the right type of light can very effectively stimulate metabolism and increase your energy production and body heat. I show you a simple way to use red light therapy in this article on “How to Build Your Own Thyroid-Boosting Light Therapy Lamp”. Another very effective stimulator of energy production and healthy metabolism is carbon dioxide. By increasing carbon dioxide retention, we can effectively increasing oxygen delivery to your cells through what’s referred to as the Bohr Effect and Haldane Effect. In order words, by increasing carbon dioxide in our blood, we can stimulate healthy oxidative metabolism for greater energy production. One simple way to do this is through bag breathing, as I describe in more detail in this article on “How To End Insomnia and Wake Up Refreshed With Hypothyroidism”. 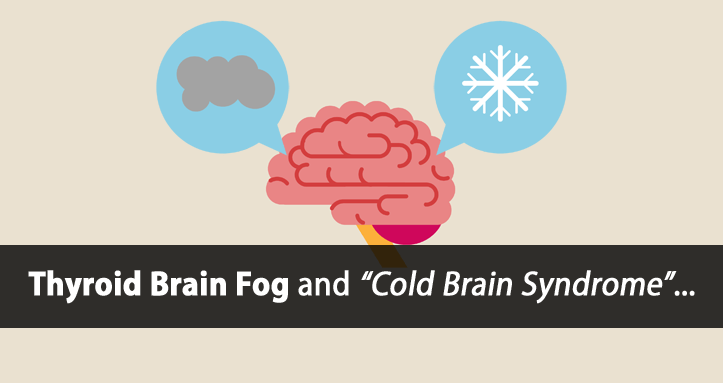 As you can see, there are many very simple ways to combat “Cold Brain Syndrome” and brain fog by increasing blood flow, energy production, and the temperature of your brain. And while this isn’t an all inclusive list, these are some of the simpler methods that we typically start with. I did something that is well known to severely inhibit thyroid function, deplete fuel reserves, reduce blood flow, and slow metabolism to a snail’s pace. All of which are a recipe for brain fog. I supported my health conscious friend by joining her on a multi-day fast. Pushing through day one wasn’t a problem. But a healthy liver can store enough fuel for a good part of the day. After that you’re out at sea without a life raft. …and I became a victim of “Cold Brain Syndrome”. What’s been your experience with brain fog? Do me a favor and let me know by leaving a comment below. My doctor says my thyroid is fine, but my opinion is that it is not being diagnosed correctly. My TSH is 3.6 and body temp is constantly below 36 plus all the other flagship symptoms. Despite all of your really thorough (and wonderful!) advice to the contrary, I ignored common sense and logic and decided to embark on an 14 day fasting schedule which included fresh juices, smoothies and master cleanse lemonade in early January. My weight had ballooned 20 lbs. in late October and despite very selective eating, exercise and lifestyle changes, nothing was changing, in fact it continued to rise (stress being the culprit I think). My body temperature had plummeted and my cognitive abilities were now so severely impaired that I was worried about losing my job. I was simply so desperate to change the tides on this thing that I did the only thing that had ever brought me results, which was a liquid fast. It was terrible, my stomach was completely upside down the whole time, I was freezing cold (35.6C) couldn’t sleep, and so pale that people were making comments. But I stuck to it because in my experience doing these fasts always gave me 180 degree results (this was my 4th time). As soon as I broke the fast and reintroduced food last Friday the colour came back to my cheeks, and everything got progressively better. My temperature is 36.2 today, higher than it’s been for months. I lost weight but more importantly, I feel just incredible. I look 20 years younger. All of a sudden, it feels like your advice is finally having an effect. I can feel it. Time will tell, but I think there are restorative benefits to fasting that go beyond the physiological and which should not be discounted. On a psychological and emotional level, fasting allows me to disconnect and reset my mind and body and I think it’s exactly what i needed. A blank slate. I think we all know that dealing with the complexities of Thyroid dysfunction can be very taxing and confusing… FRUSTRATING… especially when nothing gives you any results…. in the end I just needed some momentum, and I’ve got it now. I plan to follow your advice to a T – and more than ever before I actually EXPECT IT TO WORK NOW. Not sure why. Fasting is magical that way. So, it is a real challenge when you have no teeth. A dentist pulled my teeth and the denture does not fit, even with a reline, and so I rarely wear it. That totally changes what I can eat to stay nourished and healthy. Any tips on that? 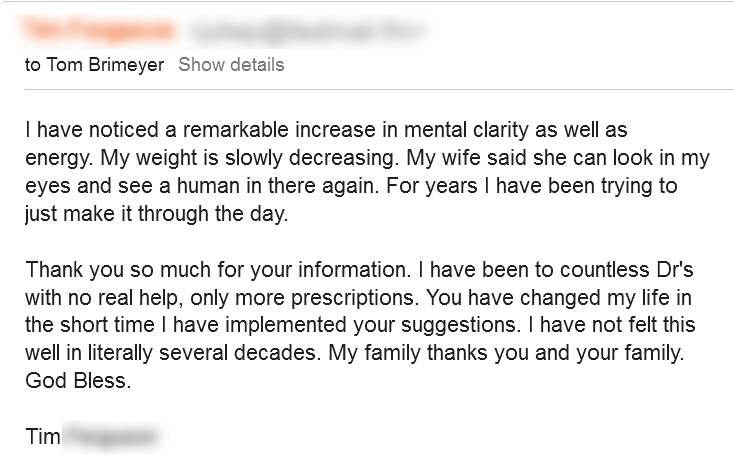 Hi Margaret, I’ve worked with clients with altered digestive anatomy who required a predominant liquid diet, which would be applicable in your situation as well. Thanks you Tom. I still have bottom front teeth so can eat softer foods also. And considering it is”chewing” that activates the enzymes in our mouths to start the digestive process, I decided to start chewing everything, even smoothies. But, I need to check on this with you. I do have your program. I am a 67 year old female, have been following this protocol for 12 days and I am seeing some positive results, particularly with my life-long insomnia. I have been diagnosed by allopathic physicians as being hypothyroid, hypoglycemic, low blood pressure (95/60), very high cholesterol (303 total). l also suffer from PTSD-related chronic elevated cortisol and stress hormones. What I can NOT deal with is experiencing severe cold intolerances. My hands were freezing cold as I read this article! I breathed in to a paper bag for 5 minutes and VOILA!!!!!! My hands are now WARM and my stress level is lessening as I type this. I breathe in to a paper bag off and on for 20 minutes at night. For the first time since my late teens, I begin to yawn and feel sleepy. This one thing which I call ‘Tom’s paper bag trick’ has made all the difference in my life. God bless you Tom Brimeyer! Hi Linda and thank you for the kind words. I’m happy to hear that it’s helping. Hi. Thank you for awesome advice. After a year with combination tratment T3 and T4, and a whole year without gluten, my brain fog has vanished, I’m in fact more clear in my brain than I have been for years. I am still VERY tired, I can only manage one thing a day, which means my work, and nothing else. But it seems like I can try dessicated medicine very soon, I am really looking forward to that. I’m particularly interested in the info about cortisol and brain fog. Everyone seems to always be talking about high cortisol. Oddly enough I still have low thyroid symptoms even on 4 grains of NDT but according to saliva tests and blood serum my cortisol is also low, at least it was 18 months ago but I feel the same now as I did then. Hi John, I written about this in other articles as stress hormones in context can be difficult to explain. On one hand we have the stress response which activates the adrenal glands and on the other hand we have your ability to produce stress hormones. Because cortisol and other stress hormomes require thyroid hormone for production, we do see occasions where the stress response is being over-activated, but because of lack of thyroid hormone and/or poor metabolism, your ability to produce cortisol is inhibited. The adrenal glands themselves are being activated regardless. So, our approach works both ways as it lowers the stress response taking the load off the adrenal glands while also improving thyroid function and metabolism to ensure that the adrenal glands can produce adequate stress hormones. Hope that helps. Thank you so much for this article. I was told that wasn’t a real symptom, even though it is very painful at times. I hear it’s “all in my head”. So I don’t want to say anything, because Dr.’s make me feel like I’m just trying to get attention. This made me feel like, It is a Thing, and there are things I can do. My brain fog got better after I started iron suppl.,but I noticed that after 2 years of taking thyroxine(T4 only) my ferritin levels droped from 23 to 7 though I have been takin regularily iron so my point is that iron is helping my brain fog ,but on the other hand T4 medication probably have the side effects of lowering the iron storage.I wonder what to do,because I can not take iron non stop. Hi Snezhana, you have to be very careful because iron is very toxic in excess. Low ferritin does NOT indicated iron deficiency. Dr. Broda Barnes showed that hypothyroidism itself causes anemia, not due to low iron, but due to poor blood quality. To assess true iron deficiency anemia you need to look at ferritin and transferrin saturation index. Long term use of iron is generally very harmful. Is there benefit to drinking high quality carbonated mineral water for carbon dioxide purposes? Carbonated beverages can help, but there are much easier ways, such as bag breathing. I’m not sure about weight loss, but right now I feel good, so I’m actually for the first time in quite a while not focused on that. I am just enjoying having more energy and clarity! Hi Stacey, that’s great to hear!